KompareIt > Home & Garden > Pools > How Much Does Pool Winterization Cost? *Pricing Data Source: HomeAdvisor members complete a cost survey after their jobs are finished. No Wasted Time: Let us do the work for you. We can quickly find reputable pool companies in your area. No Commitments: There are never any obligations to hire and our service is always free! No Uninformed Decisions: You will receive access to pool company reviews. 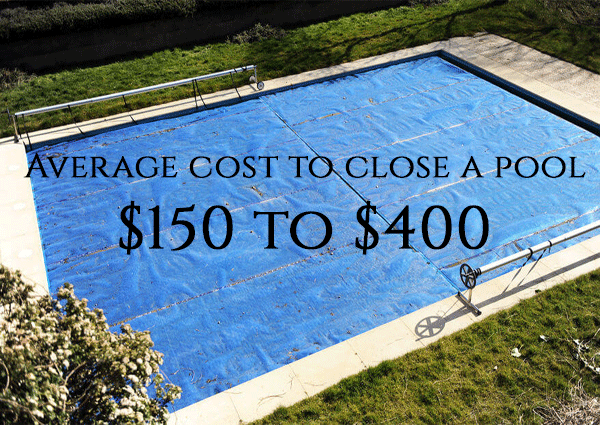 Average Pool Closing Service Costs: Should I Hire a Pro to Close my Pool? Most homeowners will spend between $125 and $375 to have their pool winterized by a professional. The national average reported cost is $233. The minimum cost a homeowner paid was $50 while the maximum reported cost was $700. No one is excited about closing the pool for the season. It means the end of summer fun and the onset of cooler weather. But winterizing your pool is an extremely important step, particularly in harsh climates, to keep it in good condition and prolong the lifespan. Failing to winterize a pool can lead to burst pipes, a damaged or failed filtration system, cracked tiles or walls and more. The cost of repairing those problems will be far more than you would have paid for a professional to do the closing. Pool services usually charge anywhere from $150 to $400 to close and winterize a pool. A small above-ground pool will fall on the lower end of that price range, while a large in-ground pool will fall on the higher end. Your location and the pool’s condition also impact price. Closing a pool can also be a DIY project - if you know what you’re doing. That’s a big IF because skipping even one important step can lead to major damage. If you decide to tackle the project, be sure to follow the manufacturer’s step-by-step instructions. First-timers might want to hire a professional to explain the process and/or handle the first closing. If you are dealing with a public pool, you may want to consider using a professional. They will follow CDC recommedations and guidelines when maintaining and closing your pool. The process involves dozens of steps, including preparing the water and adjusting the chemicals, cleaning and storing all equipment, draining some (but not all) of the pool water, draining all pipes and equipment, shutting off the filter and covering the pool. According to pool industy expert Swimming Pool Steve, you should have these items on hand when closing your pool. Here’s some additional information about some of the most important steps. However, this should not replace your step-by-step manufacturer’s guide or, in the case of a custom-built pool, professional instruction. Make sure the pH level is above 7 - ideally, 7.2 to 7.6. Adjust chlorine levels and add a chlorine stabilizer. Remove and clean accessories like ladders. Clean the pool walls with a brush. For vinyl pools, which are more susceptible to damage, be sure to use manufacturer-approved cleaning equipment. Clean skimmer baskets and remove all debris from the pool. Remove and clean the filter. Drain the pool anywhere from 1 to 24 inches, depending on the type of pool and whether you use a cover. Be sure to check the appropriate level of drainage for your type of pool. Shut off the filter pump and drain all equipment and pipes. If you live in an extremely cold climate, you’ll need to add swimming pool antifreeze, which is not the same as car antifreeze. Install the pool cover. Avoid mesh covers in cold climates. Buy a solid, heavy-duty cover designed to withstand snow and extreme temperatures. Here is a video on How to Close a Pool for your reference from the pool experts at Swim University. It's important to also be educated on the costs of opening a pool as well. How Much Does It Cost To Own & Maintain A Swimming Pool? Do You Need a Pool Closing Service Near You?